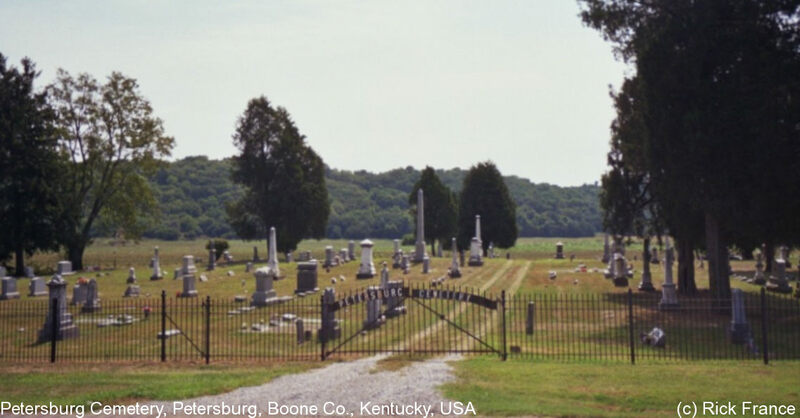 The cemetery is located on the east side of Belleview Road (Kentucky State Highway 20) about 0.4 miles west of its intersection with Front Street. The U.S. Geological Survey (USGS) Geographic Names Information System (GNIS) feature ID for the cemetery is 2569281 (Petersburg Cemetery). The Boone County GIS unique ID assigned to this cemetery is 126 (Petersburg Cemetery). The cemetery has an index number of 128 (Petersburg Cemetery) on the Boone County Kentucky Cemetery Map published in 2005 by the Boone County Planning Commission in conjunction with Johnson-Wilson Cemetery Stewards Association. The cemetery is identified as Petersburg in the index and listed as Petersburg Cemetery on page 7 of the book “Boone County, Kentucky Cemeteries” by Stephen W. Worrel, M.A. & Anne W. Fitzgerald, B.S., © 1996.